Automatically enter product lists, inventory levels and prices from your point of sale (POS) and ERP systems into your online stores, eBay and Amazon accounts, and automatically transfer sales and customer data from your online stores to your point of sale (POS) and ERP systems. 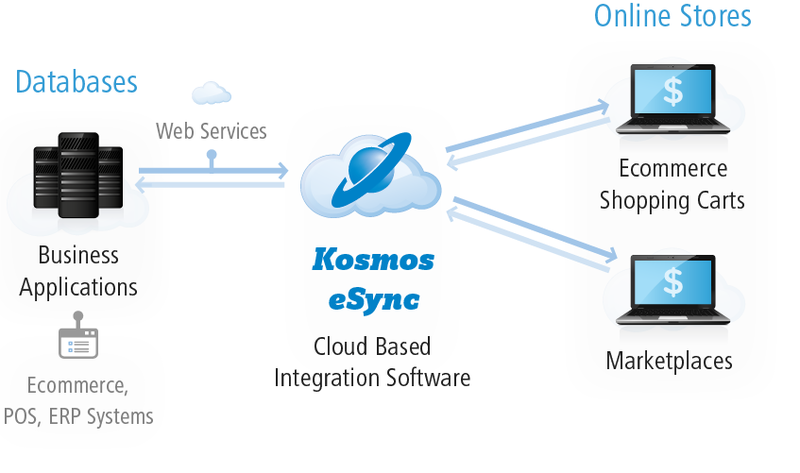 Kosmos eSync automatically synchronizes data across your online stores, eBay, Amazon accounts and your business applications, and lets you control how data is transferred and updated to meet your specific needs for each online store and application. How it works: eSync automatically moves product lists, inventory levels, prices, sales and customer data between your point of sale (POS) systems, ERP systems, online stores and marketplaces using web services or APIs. Choose a application below for details.